Also Recommended: High School DxD, The Familiar of Zero, Dog Days. Notes: Based on the light novel series by Ichirō Sakaki, with illustrations by Yūgen, and published by Kodansha. After taking a mysterious test leading to a job interview, Shinichi Kanou finds himself surprisingly drugged and taken to the Eldant Empire, a part of a parallell magical world where elves, dwarves and animal-men exist alongside human beings. There, he's being put in charge of a school meant to teach the people of Eldant about okaku culture, which sounds like a dream job at first, but comes with its own set of problems. Outbreak Company has a half elf in a maid costume. I once thought that was all I needed to know about the show, aside from the heavy otaku angling. 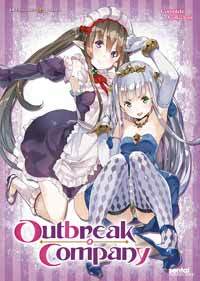 Hilariously enough, I imagine this might sound like a dream job for a lot of shut-ins, but I recommend anyone not to get too comfortable about this fantasy, because Outbreak Company has a lot of things to say about that, and surprisingly enough, not everything is going to be the kind of ego-stroking even I expected from it. It probably won't be all that apparent at first, though. Shinichi is a fairly typical slightly perverted anime, manga and games fan as these shows go, though his naiveté does lead to the show's first mildly sinister plot angle. He's drugged and basically kidnapped, and while he is sort of having his dream job handed to him on a silver platter, it still comes with a mild sense of discomfort. Still, no skin off his back, so he spends most of the remaining episodes nerding out as if his life depended on it. The first person he meets there is the half-elf maid Myucel. Her initial impression is of that of a servant, but it doesn't take long for the show to reveal that various races are treated like slaves, and quite poorly even by those standards. When she makes a minor mistake, she prostrates herself as if she's almost literally begging for her life, which confuses Shinichi greatly until he learns just what is going on. And even then, Myucel's rather excessively servile nature takes some time for him to get used to, though it thankfully gets toned down somewhat, slowly being replaced by a crush born out of her gratitude and his efforts of providing her with a semblance of an education. But more on that later. To start up the school Shinichi is hired for -- or kidnapped for, as it were -- they have to talk with the current ruling body, which is Petralka, a young girl who had to take up that mantle after her parents and her cousin's parents fought and died in an attempt to take the throne. Said cousin, Gallius, serves as Petralka's knight, and is initially mistrustful to the foreign intruders. Petralka herself looks a bit younger than Shinichi, and has the childish attitude to match it. Her curiosity about this otaku culture has her visit Shinichi's current home, which puts her at odds with Myucel, mostly out of jealousy, and this is where the whole "slaves are treated rather horribly" aspect of the show comes into motion. Petralka constantly antagonizes Myucel and at some point, shouts something utterly reprehensible towards her. It was a portrayal I wasn't quite prepared for, even with some advance warning, and for what it's worth, I was impressed with how unflinching it was. Shinichi's household also has another servant, the gardener Brooke Darwin. He's a huge lizard man of sorts, and although his looks can be a bit intimidating at first glance, he's as casually servile as Myucel is, though less hysterically so. He accidentally scares the crap out of Shinichi in the dark cellar of the mansion, which leads to him being punched by Shinichi... and Shinichi hurting his hands on Brooke's scaly skin. This leads to Brooke handing Shinichi a stick of sorts, telling him "If you're going to beat me, please use this", while Myucel chimes in with "It's a master's privilegie to beat their servants". It's a chilling statement, partially because it does have some historical significance on our end. It also helps that the show is consistently funny when it tries. Sure, it's referential as all hell, many of which would've flied straight over my head if not for the helpful bonus subtitle that points out many of them. It's not strictly parodical either; it's mostly just Shinichi playing out his behavior based on what he knows best, and often, the laughs can be had in the confused reactions of the people from Eldant. It adds a nice counterpoint to the sometimes darker and more serious plot points of the show itself. Sure, it can get to be a bit much at times, but it's mostly done for the fun of it. Another one of Shinichi's aides is Minori, a member of the JSDF. She's basically in the show to keep an eye out for Shinichi, but behind that lurks a huge fan of BL manga who latches on to the idea of Shinichi and Gallius being a part of one such, much to the consternation of Shinichi. Especially since Gallius himself actually borrows a lot of her manga and doesn't seem to be against the whole thing. Once all introductions are over with, and Shinichi's school is ready, his class is immediately filled with curious residents of Eldant, mostly elves and dwarves. The show immediately throws a lolicon joke in the viewer's direction, but takes the edge of said joke away with the revelation that dwarves always look younger than they really are... in the sense that the girls look like... well, little girls regardless of their real age, and a male dwarf has a full dwarf beard by the age of ten, if not earlier. Not that lolicon is the only order of the day when arguments can be had; purebred races like elves and dwarves do not think highly of each other, even though they do not "suffer the indignity" of being "lower" races of the kind Myucel and Brooke are a part of. Did I mention this show plays the racism card very, very straight? For what it's worth, I really appreciated just about all of what Outbreak Company had to offer, but if I had to pick something to complain about, then that would be how this "season" chose to end. I said earlier that the show could get rather sinister, and nowhere else in it does that become more clear than in the last two episodes. Shinichi does learn why he was the one who was chosen for the job, and it's a chilling truth for him to confront, not to mention having to deal with. It all leads up to a bit of a season ender of sorts, and, sadly, it looks like a sequel is an unlikely prospect, given that the anime did rather poorly in Japan... supposedly. It's a shame, because on an overall scale, Outbreak Company is fun, and as a cherry on the top of that cake, it has a male lead who earned his affections from his main love interest. What's not to like? Recommended Audience: There isn't all that much violence going on, but what is there is pretty serious stuff. The show also has a rather unflattering (and, as such, accurate) portrayal of racism and thralldom in general, and there's also some political skullduggery on display. Fanservice is light, mostly confined to swimsuits and maid uniforms. Outbreak Company © 2013 Feel.